Joudie Kalla , author of the bestselling Palestine on a Plate , introduces readers to more of the Middle East's best-kept secret - Palestinian cuisine . 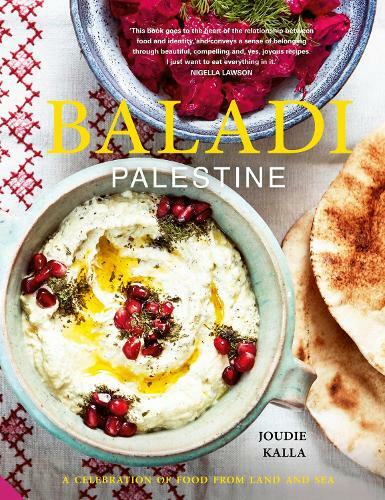 `Baladi' means `my home , my land , my country' , and Joudie once again pays homage to her homeland of Palestine by showcasing the wide-ranging , vibrant and truly delicious dishes of this country . Baladi features recipes that are broadly categorized according to the differing environments they primarily hail from , such as the land , the sea , the forest , the orchard . Experience the wonderful flavours of Palestine through daoud basha ( lamb meatballs cooked in a tamarind and tomato sauce served with caramelized onions and vermicelli rice ), fatayer sabanekh ( spinach , sumac and onion patties ), samak makli ( fried fish selection with courgette , mint and yoghurt dip ), atayef ( soft pancakes filled with cream , cheese or nuts in an orange blossom sugar syrup ), and many more sensational recipes . Dishes are designed to complement one another , and Joudie explains which work well together as a meal , as well as the varied and diverse origins of the recipes . At the end of the day she takes an entirely flexible approach , using influences from her homeland to create new dishes , and bringing her own twist to more traditional recipes .